Short fluffy snippet inspired by drunk John and Sherlock in The Sign of Three. Sherlock's face wrinkled with confusion for only a moment before he let his hands flop in a drunken wave. "Little late for us to start dating seeing as this is your stag do," he said, hints of his inebriated status in the slight slur of his words. The sticky note still holding fast to his head jumped with every curious roll of his brows. John shook his head, always forgetting that the world had a tendency to settle like jelly afterwards as Sherlock wobbled in his sights. "I didn't ask you out." "Mm." John pulled his lips thin, thinking about their game and how, if Sherlock asked, he wouldn't know the answer to the subject of his friend's sexuality. Rather hard to give a yes or no response to something that could only vaguely be answered with a shrug. "I just--I'm curious,"
"Curious? That's... flattering I suppose." Sherlock managed another sip from his tumbler with surprising grace before nearly dropping it once placed on the side table. That was generally the way of it though. Sherlock had two modes: ballerina and baby giraffe. It was rather interesting to see in which situations the one came out instead of the other. John sat up in his chair, letting his elbows brace against his knees. "Sherlock, I'm not--"
"There are two reasons why you would care about my sexuality. One--you're afraid of it, or two--you're hopeful." "Nope. The answer's 'C', none of the above," he countered, watching as Sherlock folded forward in a similar posture, though he seemed more caught against his limbs than supported by them. 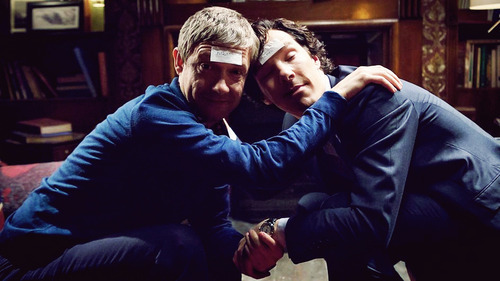 John put a hand to his shoulder to brace him as Sherlock threatened to pitch forward on inebriated undulations. His hand flapped pointlessly in the space between them so John took hold of that as well. Sherlock smirked, eyes heavy. "Do you ask strangers if they're carrying a gun?" he asked. John felt the paper on his own forehead crinkle with his lost expression. "Nnnnope." "Precisely." Sherlock almost looked pleased with that as his weight pressed him forward enough that his breath fell to John's nose. "The only people you care whether or not they are armed are either the people you feel threatened by or the people you most want to be protected. So really, the question is, are you afraid I want to kiss you, or is it you who wants to kiss me?" John felt his expression freeze for a moment, his eyes growing dry from being stuck open on a thought. Actually, he couldn't quite remember the question anymore but it sounded smart when Sherlock said it and the man was nothing if not a genius. "Yeah, fair enough," he admitted, and leaned in to give him a kiss. The only thing awkward about it seemed to be the way neither of them had strong enough necks not to collapse into the other's face with noses stabbing into cheeks and teeth a little too involved. It should have made it the worst kiss John'd ever had but there was something about the feel of his shadow over his face, the weight of his hand in his palm, the pressure of his weight against his bracing arm as the detective was drawn to him as though ordered by gravity. It was stellar. John hadn't the power in his limbs to part their lips but with a roll of his head he could shy them away till only their foreheads remained touching. "Yeah, best to keep the safety on that," he joked, licking his lips out of habit. "Mm," Sherlock hummed. "You taste like a week old sock." John rolled his eyes even as he chuckled. "Ah, that's nice. Nice picture of what it would have been like. Morning, sweetheart, you taste like a sock." "I'd kiss you even if you did taste like fermented feet," the detective said, all but melting into John as he smiled with eyes long closed. John gave his hand a squeeze, feeling illuminated even in the other man's shadow. "You're a regular Romeo, you are," he whispered, and hadn't the heart to move him even though the game was still, more or less, on.